It’s been a little too long since my last Recipes for Mom post. I have ideas, but always seem to be short on time! For details on my Recipes for Mom series, check the intro + part 1 post. 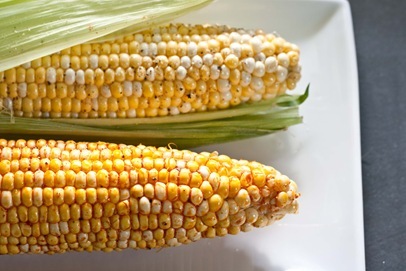 Growing up in Ohio, one food that we had around all summer long, was corn. Fresh from the little market stands along the street, I remember inspecting + filling up bags of corn each week. 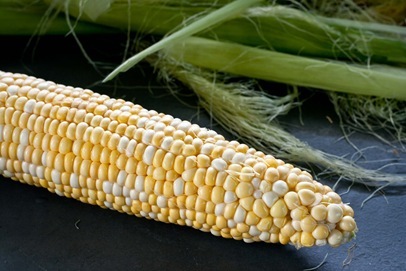 By inspecting I mean, shucking the very top of the corn and taking a peek to see what it looked like. My least favorite part was coming home + being on corn shucking duty. 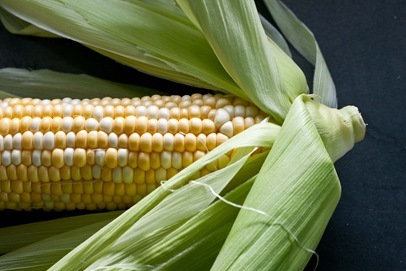 I would sit outside on the porch, with the plastic bag of corn to my left + a brown paper bag in front of me. 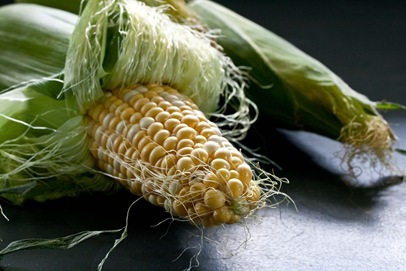 With one ear of corn over the paper bag, you crack the end off, then peel back the leaves and tear them off. Then it’s time to pluck off all those annoying “hairs.” They always stuck to my fingers and I could never get them all off. 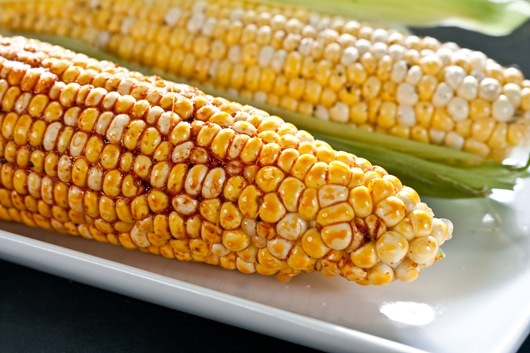 All those years growing up, we made corn one way. That I can remember. Boiled! 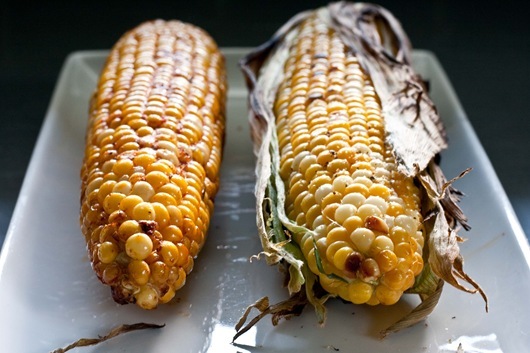 My mom would boil the corn, while my dad grilled outside. Then we rolled the corn on a stick of butter + seasoned with salt. I’m sure my parents also added pepper, but I was all about the salt. The boiling method works perfectly well. I enjoyed many years of delicious corn. But there is this other method that just makes things a little more interesting. Grilled corn. I remember first hearing about it and being utterly confused. How could that work? Well it does and it couldn’t be easier. To me, it’s even easier than boiling them in a huge pot of water. 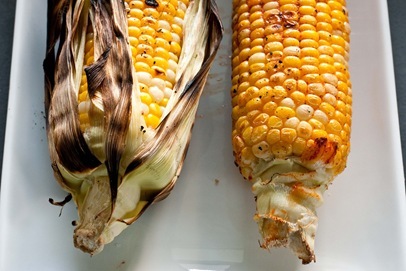 Now I’ve seen a ton of grilled corn variations. My method of choice? 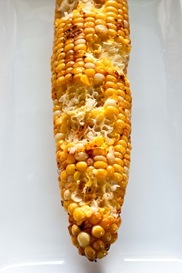 1 + 2 I’ve never found a reason to soak the corn. If it’s good quality corn, why does it need to be soaked? And foil? Unnecessary. For this tutorial, I’ll explain methods 1 + 2. Let’s start with method 1. 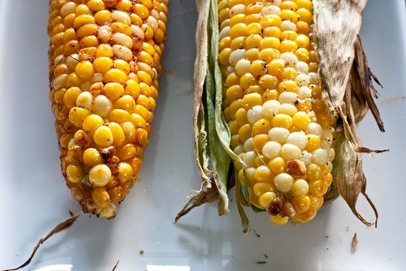 Crack the stem off the end of the corn + discard. Peel back the husk, tear off + discard. Pluck off the hairs [actually called silk] + discard. Rub with 1t oil + season with salt + pepper or whatever else you like. Grill for a total of 10-12min, rotating 3-4 times. 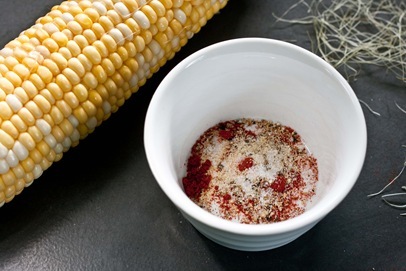 Now, if you want to make things more interesting, you can throw together a little spice mix like I did below. Mix spices together + combine with oil. 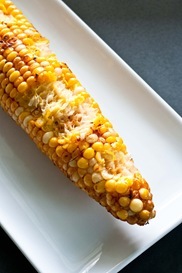 Rub into corn. Oh, smoked paprika. How I love thee!!! Seriously, if you’ve never tried it, this is a must buy spice! I have a huge container of it from Costco, that cost about $3.50. Now, on to method #2. Carefully, peel back the husk, but do not tear off. 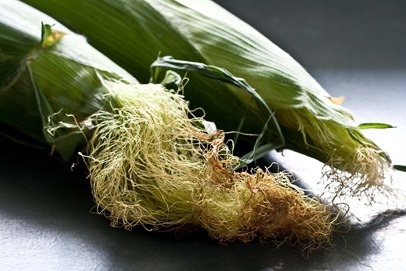 Pull the attached husks back up over the corn. You can add whatever other seasonings you want! A few years ago, I picked up a set of silicone cooking ties. They can withstand really hot temperatures and have come in handy for so many things. Much easier to use than cooking twine. I found them at Bed, Bath + Beyond. While they help keep the husk wrapped up around the corn, tying is not necessary. Instead of oil, salt + pepper, try spicing things up a bit. After placing on the grill, shut the lid and only open to turn. Rotate 3-4 times for 10-12min. 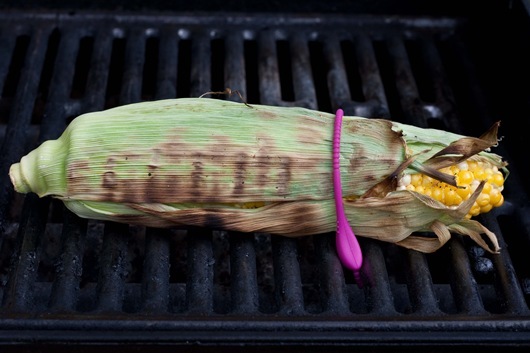 If you’re not seeing char marks, your grill is not hot enough. Be careful not to overcook. 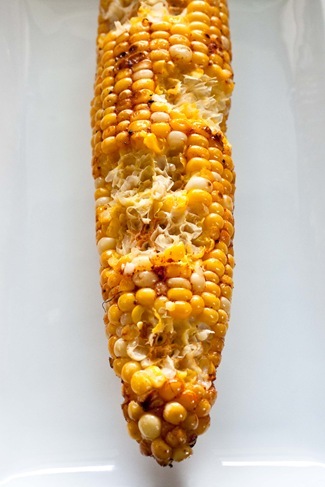 No one wants mushy corn. Bring inside + let cool a few minutes before serving. Peel back the husk [if going with method 2] and chow down. Since figuring out this method, my parents have asked me numerous times how to go about it. 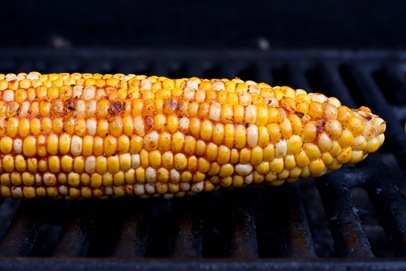 Instead of telling them how to grill corn over the phone, I figured this post would be much more helpful. 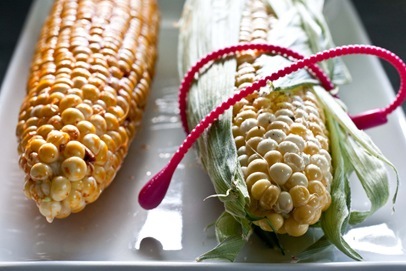 I’m not sure what this means about me as a person, but I eat my corn pretty haphazardly. 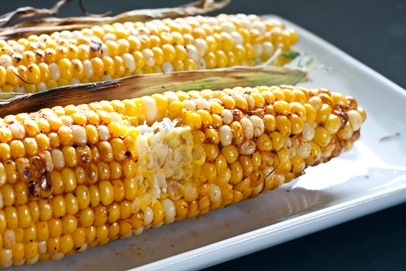 Perfectly juicy, crisp, organic, grilled corn.